This Syrian restaurant serves up superior staples like falafel and lamb kebab, but the more adventurous shouldn’t pass up an appetizer of raw kebbeh, finely ground uncooked lamb mixed with cracked wheat and spices, topped off with olive oil. Standouts at this well-stocked grocery are the delicious baked goods. A pound of crisp, not too sweet cookies flavored with pistachio and sesame seeds make an exotic take-home treat. The flavors of southern Turkey anchor the menu at this far-flung café. In addition to the extensive seafood offerings, other popular dishes include the fried calf’s-liver cubes and haydari: a walnut, garlic, and yogurt dip that tastes great with pita. The menu can be overwhelming at this Palestinian storefront, so you’re better off sticking to the meze in the display case. 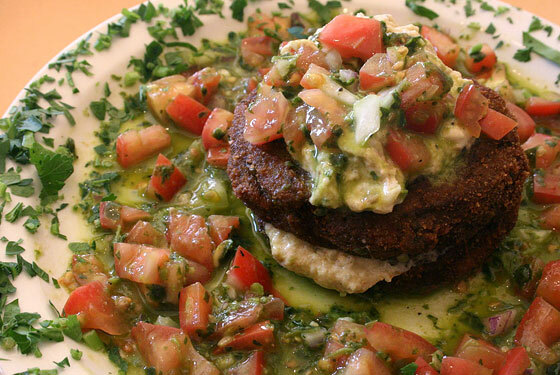 The hummus nails the right blend of lemon and garlic, but the eggplant napoleon, which layers fried eggplant slices with baba ghannouj over a tomato-and-basil salad, is the real knockout here. Don’t mind the shabby-looking grocery setup in the back–the front deli counter is the main attraction here. The shawarma sandwich, with tender slices of beef or chicken covered in garlic sauce and studded with cornichons, is worth the trip. Though Egyptian cuisine sometimes skews more toward Mediterranean than Middle Eastern, this late-night destination manages to balance the flavors of both. Stick with the house specialties here, like the savory koshary, a starchy and saucy mixture of pasta, lentils, and onions.